Apparently, this might happen. The Phillies might be able to acquire the notorious Manny Ramirez– a.k.a. the best right-handed hitter since Willie Mays. This has to be good, right? Right?!? For those who say “Yes,” the reasons are simple and straight-forward. His stats are mind-boggling. His 162-game averages are as follows: .313 batting average, .409 on-base percentage, .550 slugging percentage, 40 HRs, 132 RBIs. Plus, he always hits in the clutch (probably because he does not recognize the difference between a “big” situation and just another at-bat). As good as Pat Burrell has been, there is no question that Manny is a serious upgrade in leftfield. Plus, Manny has a deep respect for Charlie Manuel, from their days together in Cleveland, so between Charlie and the Phillies contending ways, Manny would probably welcome a shot in Philly. For those who say “No,” the argument is much more contextually-based and subtle. This year, he has shown to be, at the very least, a minor distraction, and, as some may argue, a cancer, in the clubhouse. Even the hall-of-famer and Red Sox fanatic, Peter Gammons, calls Manny a “tired act,” and blatantly calls him out for being “all about the money” and caring little about his Red Sox “family.” The opponents may also make the financial argument, in that Manny is convinced that his 36-year old body is worth $100 million dollars beginning next year. This brings up another interesting situation for the Phils because if they are going to continue to get production in leftfield, they are probably going to have to shell out big bucks this offseason, be it Manny, Burrell, or another available stud. Or, we may be looking at Jayson Werth hitting 5th next year. So, what do I think? Honestly, I think it depends on what (other than Burrell) the Red Sox want in return for Manny. If it is a straight-up deal, with maybe a marginal prospect thrown in, I think the Phillies have to do that. If it costs the Phils one of their major prospects (Carrasco, Marson, etc. ), then I would probably lean towards the four-year younger Pat Burrell. However, I think if you hooked me up to a lie-detector today and asked me how I would feel with a Manny Ramirez in my outfield, no matter what the cost, I would probably be doing cartwheels. In my lifetime, I have seen three hitters that I legitimately feared whenever they came to the plate against a team for which I rooted–Barry Bonds, Albert Pujols, and Manny Ramirez. With all due respect to the Mark McGwires, Ken Griffeys, and Chipper Joneses of the world, it is a different level of fear. And, I think that if the Phillies do have a legitimate shot to land Ramirez, they have to do it. There is an old adage about the role of momentum in a long baseball season that says: “Momentum is the next day’s starting pitcher.” Granted, there is some wisdom in this and there is definitely something to be said for the best teams’ abilities to not get too high and not get too low throughout the 162-game season. However, I do not think that it is quite that simple. I believe that there are certainly some times throughout a season that can turn the tide, so to speak, and set the tone for a winning streak or a big run. For example, if you talk to any of the 1993 Phillies about “season momentum,” they will probably all mention things like the miracle comeback against the Giants, the Mariano Duncan grand slam off of Lee Arthur Smith on Memorial Day, the Milt Thompson catch in San Diego, and the infamous Mitch Williams game-winning hit at 4:41 in the morning. And, all of these things will be mentioned in the context of spurring on the team, building character, and setting the table for the wonderful season that was ahead of them. Well, 15 years later, if this Phillies team is going to provide magical memories for today’s 14-year olds like the 1993 team did for me at 14, a reference to last night’s game against the Mets might just appear on a Phillies blog in 2023. Down 5-2 in the ninth, and staring at second place for the first time in close to two months, the Phillies rallied for 6 runs in the top of the 9th to beat the hated Mets. It seemed as if the Phightins missed their chance in the 8th, as Utley, Burrell, and Howard went quietly, leaving the 5-6-7 hitters due up in the 9th. But, just as the gloom started to fall in on Jayson Werth and his 0-2 count, he battled back to rope a leadoff single to center. The next batter was Greg Dobbs, who was intelligently in there as a pinch-hitter for the struggling Pedro Feliz, also fell behind 0-2, but then roped another single, bringing the tying run to the plate with nobody out. Shane Victorino also singled and the bases were loaded. Then the memories were made with the next three hitters, starting with the signature play of the whole comeback. With the bases loaded and nobody out, down by 3, Carlos Ruiz hit a high chopper over the mound, where Jose Reyes barehanded it and tried to run to the bag for the force at second. However, Reyes must have misjudged just who was running from first, as Victorino, one of the fastest players in all of baseball (and who always gets a great jump and runs hard) beat Reyes to the bag–safe all-around. Still down two, however, the Phillies went to light-hitting reserve outfielder, So Taguchi with the game on the line. 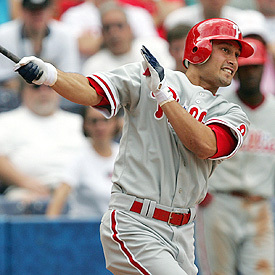 Taguchi fought off several nasty two-strike pitches before delivering the big hit–a game-tying double over the head of Endy Chavez in rightfield (which also got new Phillie starter, Joe Blanton, off the hook for the loss). Jimmy Rollins delivered the third consecutive memory of the inning, as he laced a double down the line, giving the Phillies a 7-5 lead (adding another on a botched double-play back to the mound), which would be more than enough for Brad Lidge to nail it down. Will this amazing come-from-behind win (led by guys not named Utley or Howard) be a catapult to a second straight NL East championship? Maybe. Maybe not. But, if the Phillies do go on to, say, sweep this series and never look back, this game–this inning–will probably be remembered for years to come as a defining moment in the 2008 Phillies season. Blanton is an innings-eater. So, even if he does not end up being a lights-out starter in the playoffs like the Brewers and Cubs hope of Sabathia and Harden, respectively, at least Blanton will give the Phillies more than the 4+ lines that they have been getting from Adam Eaton every fifth day. And, this resting of the bullpen could go a real long way in August and September as the Phillies continue to try and hold off the red-hot Mets. They did not really give up that much for him. The Phillies unloaded three prospects to the A’s, with the best being an A-ball secondbaseman Adrian Cardenas. Cardenas was a sandwich pick in the 2006 draft and was drafted as trade bait from the very beginning, considering the Phillies are pretty comfortable with their secondbase situation in the foreseeable future. They also gave up their 2007 third-round pick, Matthew Spencer (an outfielder in A-ball) and their 2005 10th round pick, Josh Outman (a left-handed relief pitcher in AA). Outman will probably reach the bigs, but does not project to anything more than a specialist left-hander, and Spencer has a decent “upside” and has a chance to reach the bigs, but is only currently hitting .249 at Clearwater. So, in the grand scheme of things, I do not think that the Phillies will be looking back on this trade and kicking themselves about the guys that they gave up. This is not a rental. As I mentioned in my defense of their interest in Blanton, yesterday, I believe that this is a smart move because Blanton is not a free agent until after the 2010 season. Therefore, the Phillies have acquired a 27-year old pitcher who is clearly on pace to complete his fourth straight season of at least 190 innings pitched (including 230 innings last year). So, you can expect the Phillies to get 500 decent innings out of Blanton over the next two and a half seasons. And, in this era of baseball, the so-called “innings-eaters” are becoming more and more valuable because of their increasing rarity and the dearth of (and expense of) quality middle relief. At worst, Blanton will be an innings-eater in the vein of Livan Hernandez. At best, Blanton, whose ERA in both of his 200-inning seasons was under 4.00 (and WHIP under 1.25), is a solid #2 starter and possibly a borderline All-Star. I still believe in Brett Myers. Again, this is probably going to hurt my “objectivity” credibility, but I still believe in our #2, which means Blanton only has to be a solid #3–something that is a much easier sell. I am not going to get too far into why I believe in Myers for fear of sounding like a fool, but let us just say that I think Myers can undoubtably be a solid #2 in this league, which means that for the next two and a half seasons, the Phillies can run out solid pitchers at all three top spots in their rotation. Yes, I am probably completely crazy at this point, but that is what 75 consecutive championship-less seasons will do to a man (I do not count the Flyers seasons as towards my misery because, well, it is hockey). In summary, Blanton is, admittedly, probably closer to Livan Hernandez than anyone who played in Yankee Stadium on Tuesday night, but still, I really like the deal because the Phillies had to do something for this year and the next couple years, and this move was not very expensive from a prospect or from a salary standpoint. It is the time of year when baseball fans are constantly checking various websites in hopes of finding news that their team just landed CC Sabathia or Rich Harden. Well, unfortunately for the Phillies, both of those guys have already been traded–and, to make matters worse, traded to NL contenders. Regardless of the fact that the only two bonafied top-of-the-rotation guys that are available have already been moved, the Phillies still seem willing to make a move for starting pitching. And, if you ask me, this is a good thing because this staff may eek out the division again, but almost certainly cannot win the pennant. To preface this, I just want to say that I do not understand why there has not been more talk about Roy Halladay on the market. It seems that Toronto is going nowhere and Halladay is not that young and certainly not cheap. Plus, the price tag that he would command in this pitching-starved enviromment around ML baseball and its wide-open races has to be astronomical. If I were the Phillies, I would back up the truck for a Halladay, but that is a conversation that seems moot right now because Toronto seems to be refusing to move him. A.J. Burnett — I am actually bigger on Burnett than many people, as far as what he could bring to the Phillies for this year. Plus, I do not think that it would cost all that much, in terms of prospects, for us to get him. If he was on a one-year deal OR a long-term contract, then I would probably say “Go get him.” However, he is on neither (or both). Burnett has a player option for the next two years on his contract at over $13 million per year. That means that if Burnett comes here and pitches well, he opts out and the Phillies cannot afford him. But, if he comes over and struggles or gets hurt, he stays on the books for two years. That is bad for the Phillies. Still, I would like to see what he can do here because I think his stuff speaks for itself. Joe Blanton — Yes, his numbers kind of stink this year. Yes, the A’s are incredible at taking prospects from teams that amount to stars. 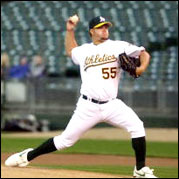 So, yes, I am terrified to trade with Billy Beane for a bad pitcher. However, I think Blanton has great stuff and may just need the ole “change of scenery.” He only makes $3.8 million this year and is arbitration-eligible for the next two years, so this could be a move for ’09 and ’10 also. I do not think it would take either of the Phillies two best prospects to get him, either. So, I say, take a shot at Blanton. Erik Bedard — Let me state the following first: Erik Bedard has proven, on multiple occasions that he has no heart and no onions. Living in Baltimore, I have heard countless stories from angry, impassioned fans talking about how Bedard would ask out of games and just simply refuse to put it up for his teammates. That scares the crap out of me. BUT…he is really, really good. It is not often that you can acquire a guy of that caliber at all, let alone for about sixty cents on the dollar, which is all it would seem to take to pry him out of a bad situation in Seattle. The Phillies NEED a pitcher, and Bedard is one of the most talented pitchers on the planet. Go get him! CBS announed today that Billy Packer will not be back as the lead broadcaster for their NCAA basketball coverage throughout the upcoming 2008-09 season. Jim Nantz will regain his play-by-play role, but will be joined by Clark Kellogg as the color analyst, who is moving from the studio to the booth. The biggest implication of this move will be felt in March when the Final Four rolls around and the games will be broadcast without the voice of Billy Packer for the first time in 34 years. Yes, THIRTY-FOUR years. In an era of opinions that change as the wind blows, and that old saying of “15 minutes of fame” becoming more and more literal, there is really something to be said for a guy who has broadcast the championship of a sport for three and a half decades. Packer is probably as good as it gets when it comes to in-game basketball analysis, and would probably make a better coach than most people who are currently paid to do so. So, it would be pretty safe to say that the ending of the career of a guy who is has been the best at what he does for the entire span of my lifetime would cause me some sadness and influence me to “pay my respects” to a great career. Or, at the very least, have my mind wax sentimentally about all the great Final Four games that Packer has called…all the memories. Well, I have no desire to do any of that. I am glad to see Packer go, not because I am tired of him or feel that there needs to be a fresh voice in the Final Four. Nor is it because I am overly excited for Clark Kellogg to get his much-deserved shot at the #1 spot. I am glad to see Packer go because he possesses one of the most unattractive personalities in all of sports. He is (and always has been) obnoxious, condescending, irritating, and above all else, arroggantly inappropriate. He believes that because he is one of the most keenly insightful basketball analysts on the planet that he can say anything he wants about the game of basketball (and the people affiliated with it) whenever he wants with no repercussions. His condescending attitudes and statements are not relegated to in-game issues, though. In 2004, Packer admonished the selection committee for granting an Atlantic 10 team a #1 seed. He believed that the St. Joe’s Hawks, despite playing a very difficult schedule to the tune of 1 loss all season, would clearly finish in the bottom of the ACC. Well, St. Joe’s went to the Elite Eight (including a win over Packer’s alma mater and ACC school, Wake Forest), before losing a very close game to Oklahoma State, saving Packer the embarrassment (that I am sure he would not feel) of calling a Final Four game that included the Hawks. In 2006, the Missouri Valley Conference was granted four bids–3 more than Packer thought warranted. Again, he brutally attacked the selection committee for their apparent “preference for the little guy at the expense of clearly better basketball teams.” And, once again, Packer’s comments proved anything but prophetic, as both Bradley and Wichita State reached the Sweet 16 of that tournament. Now, all of the above incidents were basketball-related and can, therefore, be forgiven and chalked up to a man who just thinks he is infallible when it comes to his trade–not a positive quality, but far from exposing a serious personality flaw in the man. However, there are several incidents through Packer’s career that may give display to the fact that not only is Packer arrogant and condescending about basketball, but he is probably a cruel, possibly even bigoted individual. In 1996, Packer referred to Georgetown guard Allen Iverson as a “tough, little monkey.” Now, Packer claims not to have meant it in a racist way, and even John Thompson, who is very outspoken when it comes to racial relations in the game of basketball believes Packer not to be a racist. I believe Thompson and do not think that Packer’s arrogance manifests itself in racism. Other forms of bigotry, however…maybe. Maybe. But the biggest problem is the same problem that Packer has had his entire career–he does not see his mistakes. He does not apologize for hurting anyone. He believes that because he played basketball for Wake Forest and is the only person to have provided color commentary of a Final Four game for three and a half decades that he is above anyone else when it comes to the game of basketball or anything that remotely has anything to do with it. Billy Packer, your analysis may be missed, but you will most certainly not be. In the first day of free agency in the post-Billy King era, it is made blatantly apparent why there is a post-Billy King era. I find it very difficult to believe that King would have had wherewithal to accomplish the feat pulled off by his predecessor yesterday. Ed Stefanski, the new Sixers GM, was able to trade Rodney Carney (who was made expendable), Calvin Booth, and a future #1 draft pick to Minnesota for a cap exemption. Why would he “sell” the Sixers top draft pick two years ago and a future draft pick? Well, because he knew he would be able to woo the best free agent on the market away from the Wrong Coast back here to the Right Coast. There has been Elton Brand talk for the Sixers for many seasons now, but never did I think that it would happen. And, while the lead stories in the news today will focus on the debacle that is the Clippers, what will probably be missed is just how great of a move this is for the rising Sixers. John Hollinger explains why this makes the Sixers a true contender in the East as soon as this year and definitely by 2010. So, for the second straight major sport free agency period, the hands-down best player on the market has chosen Philadelphia. It is strange to think that this city still has never seen a game with either Asante Samuel or Elton Brand in the home team’s uniform, yet those two players have this town buzzing.